ELLIS BATH | Philadelphia, PA When working with limited funds, cost engineering is paramount! 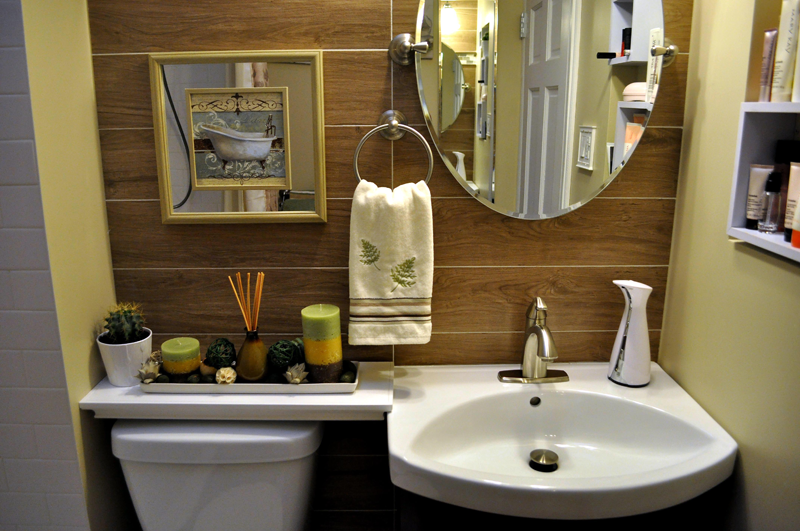 Here we decided to invest in superior plumbing fixtures and saved on the mirror, art and accessories. 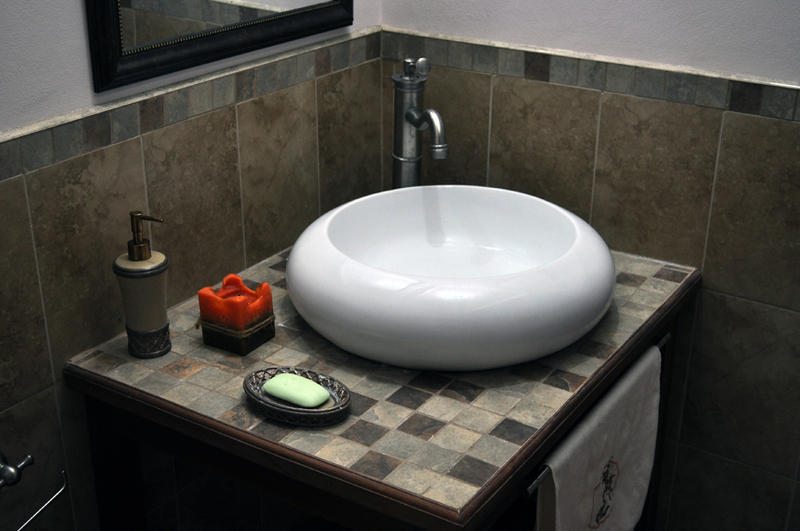 Budget-friendly subway tiles are accented with porcelain plank tiles, and a glass mosaic. ELLIS BATH | Philadelphia, PA This small bathroom was once stuck in the forties with black and white mosaic floor tiles, black and white wall tiles and antiquated plumbing equipment. 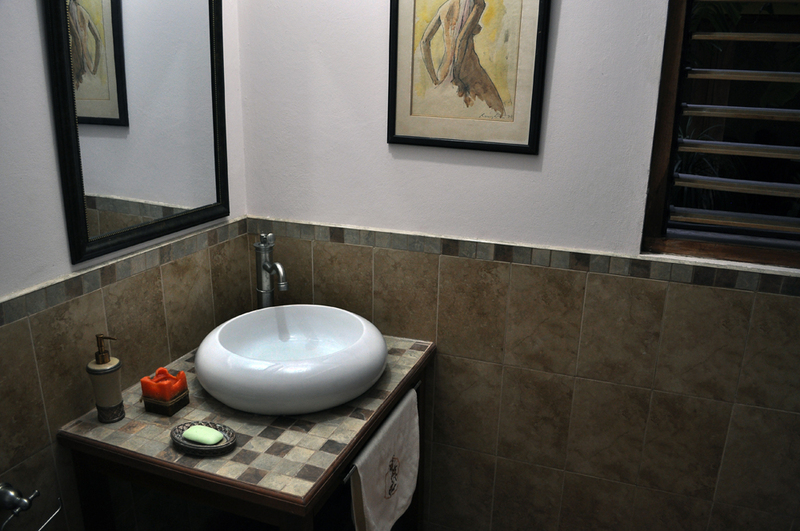 Our aim was to create the more open, functional, modern, warm and charming bathroom you see here. LE FRANCE | Unity Hall, St. James Have a small room? “Paint it white, add mirrors”. I absolutely disagree! I say make it special! 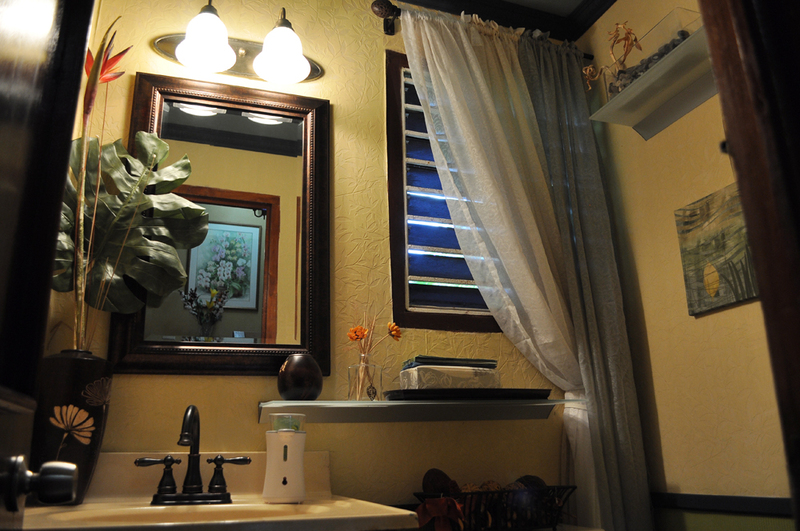 This 25 square feet powder room is a great example of this belief. From its painted wallpaper to its blue/green ceiling and trims – an experience each guest will carry home. ELLIS BATH | Philadelphia, PA When working in a small function-filled space, attention must be given to composition and often finding creative storage solutions. CJW RESIDENCE | Spring Farm, St. James The evolution of this powder room began with an old table the Client had. 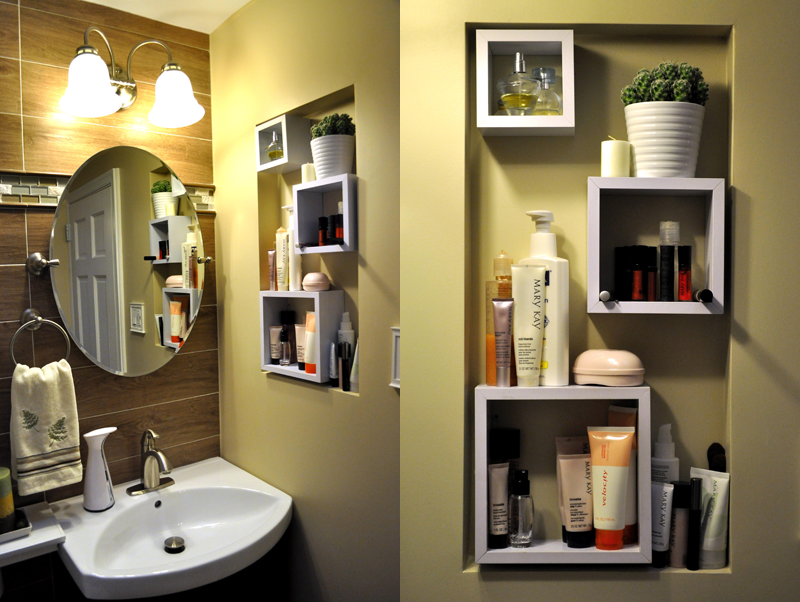 We modified it by added open shelves, a towel bar and tiled counter top. Thus, the vanity you see here was born and so was everything else. CJW RESIDENCE | Spring Farm, St. James Inspired by the nostalgia of a bygone time, but modernized for comfort. From its single lever well tap to its counter top vessel sink, and stone accents, it takes you back. We all have to go. But isn’t it better when going takes us places, and make the process so much more a pleasant one? LE FRANCE (left) CJW RESIDENCE (right) | Unity Hall, St. James (left) Spring Farm, St. James (right) We design for the senses. While visually appealing, we like to vary our textures to create tactile interactive environments. 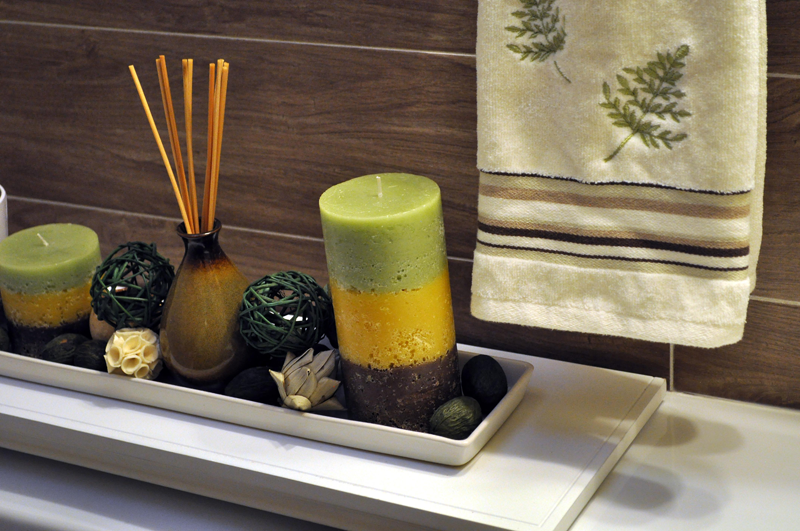 The inclusion of art inspires, and the soft smell of candles, fragrant jars, and potpourri leaves a subtle sweet memory on the nose. 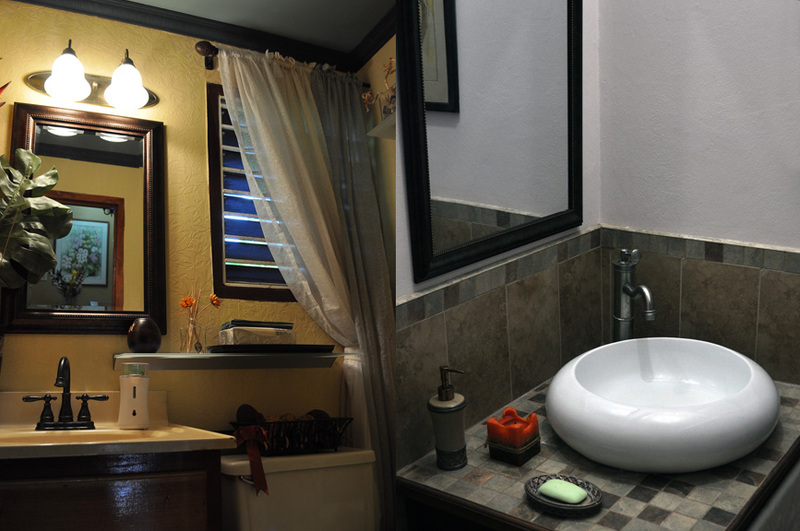 Hands-free soap and trash dispensers add to the comfort of these rooms.